Rescue workers and volunteers struggled to pull victims from the deadly, sticky mess. 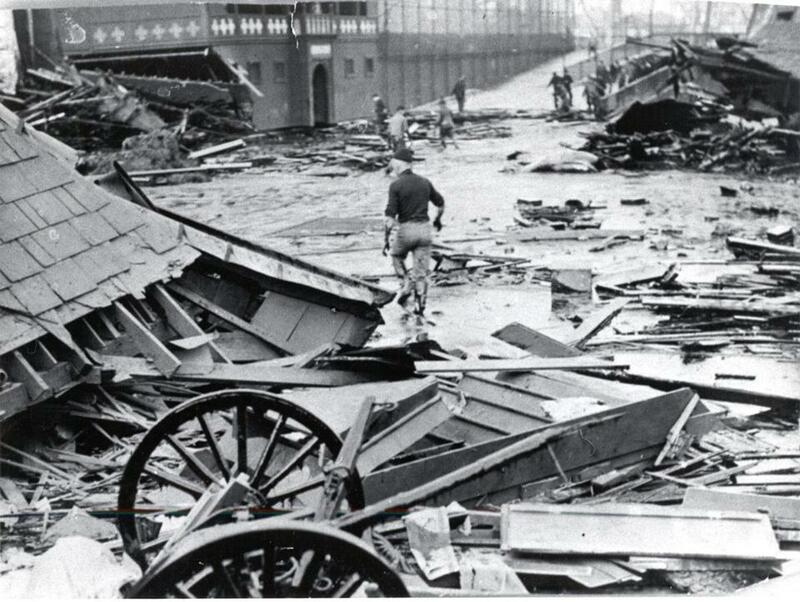 Almost a century ago, a giant storage tank in Boston’s North End ruptured, releasing a massive wave of molasses that killed 21 people, crushed buildings, and tore a firehouse from its foundation. The Great Molasses Flood of 1919, one of history’s most bizarre disasters, has remained a topic of grim fascination ever since, prompting a range of historical analysis. Now, a study has shed new light on the cause of the collapse, finding that the tank was stressed well beyond capacity and made from a steel susceptible to fracture — the same type used on the Titanic. Ronald Mayville, a senior structural and metallurgical engineer with Simpson, Gumpertz & Heger in Waltham who has researched the disaster for years in his spare time, said several design flaws led to the catastrophic failure. The steel was too thin to withstand the enormous stress of 2.3 million gallons of molasses, a weakness builders should have known at the time. “No one disputed they underdesigned the tank walls,” he said in an interview Tuesday. Mayville, whose research was featured in the September edition of Civil and Structural Engineer Magazine, said the walls were at least 50 percent too thin, even by the more relaxed standards of the day. What builders at the time could not have known was that the type of steel used for the tank was brittle because it contained a low amount of the chemical element manganese, making it more likely to crack. Mayville’s findings run counter to one of the main theories behind the collapse — that a buildup of carbon dioxide inside the tank burst the tank’s rivets. After a three-year trial, an auditor ruled against the company that owned the tank, US Industrial Alcohol, finding that the tank’s riveted construction did not meet structural standards. But the exact cause of the failure was not determined, Mayville said. For what he believes is the first time, Mayville analyzed the collapse using modern engineering techniques, such as finite element analysis. He found that the fracture probably began in the 20-inch manhole, and that a rivet hole directly above was highly stressed and could have deteriorated. “Today we know you have to reinforce the side of the hole to keep the stresses down,” he said. The tank, which stood close to the harbor near Copp’s Hill Burying Ground, was used to store molasses used in the production of munitions. As World War I raged in Europe, the facility was built in a rush, with safety precautions unheeded. Mayville said the builders were probably under pressure to build the tank quickly and never went back and reinforced certain areas. The tank had been filled nearly 30 times since its first use in 1916, but was near capacity only four times, Mayville said. The repeated use, and the added weight, probably contributed to the disaster, he said. Mayville, who has long held an interest in engineering disasters, said his work received a major boost by the discovery of an archive at Lehigh University that belonged to a consultant who testified in the trial. “That turned out to be a treasure trove,” he said. Mayville is continuing his research, and said open questions remain. The firm that built the tank was reputable, and he hopes to learn more about why the firm’s executives made the decisions they did during construction. Stephen Puleo, author of “Dark Tide: The Great Boston Molasses Flood of 1919,” said the tank was rushed to completion, and was never inspected. It immediately showed signs of disrepair, he said. In response to complaints, the company painted the steel-blue tank a brownish-red, presumably to camouflage the leaks. The strategy was ineffective, he said. When the structure collapsed, it “almost literally disintegrates,” he said. The gooey molasses formed a tidal wave that reached a depth of 15 feet and in places was 100 yards wide over a two block area. 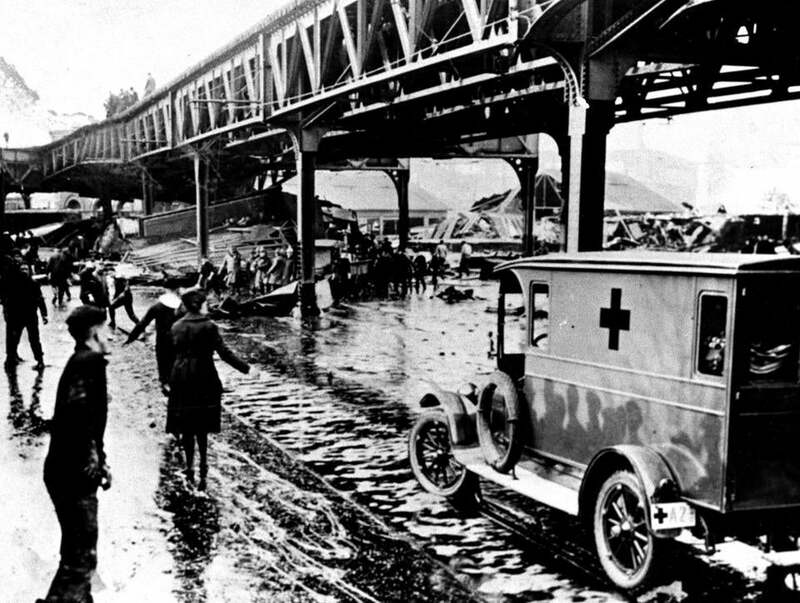 The disaster, which occurred on Jan. 15, 1919, submerged two city blocks within seconds, crushing people in the streets. At least one victim was swept into Boston Harbor by the 25-foot wave. The company claimed that anarchists had blown up the tank, but the auditor awarded the plaintiffs $300,000. Bryan Webb, a civil engineer, has presented conceptual designs for a memorial to the victims of the disaster at the top of the Rose Fitzgerald Kennedy Greenway near the North End. Webb, 24, said the memorial, which would be part of a proposed park at the spot, would commemorate a tragic event in the city’s history, one that spurred major reforms in building standards and zoning laws. “We have to cherish those, and hold onto them,” he said.